The Standard Code Signing certificate on SimplySign The Standard Code Signing Certificate on SimplySign works with Java Code Signing and Microsoft Authenticode technology. It has been created to sign code digitally in the cloud (in the mode of user or software kernel-mode). Guaranteed avoidance of "unknown software publisher" and "Dangerous software" warnings. Assurance for customers that software used by them comes from a source they can trust, meaning that it is safe for them. The software does not have viruses that may get into computer equipment, and unwanted add-ons, such as spyware. Why should you sign your software with a Code Signing Certificate on SimplySign from the CERTUM Certification Authority? Files or code signed by a certificate shows first and foremost that a brand has a good reputation, and in this way customer confidence increases. Clients can check software developers and guarantee that code is secure. Data defended by the certificate protects the intellectual property of the author. The Standard Code Signing Certificate on SimplySign signes files such as: .exe, .docm, .xlsm, .pptm, .xpi, .jar, war, .ear, .dll, .ocx, .cab, .msi files .sys, .cat, .msp .xpi, ocx, ect. 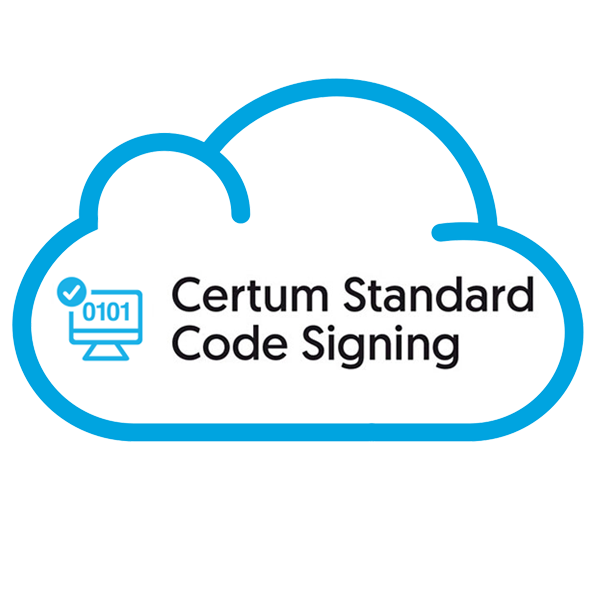 The Standard Code Signing Certificate on SimplySign can be used with: Microsoft, Office, Microsoft Visual Basic, Firefox, iOS, Adobe, Java, ect. Product is available in the form of an electronic code. Product requires the installation of the free SimplySign Desktop software and the SimplySign mobile application. This service does not apply to M2M applications, and mass signing of e-documents. By signing the Code Signing on SimplySign Certificate you do not need a physical card or a reader! Your code and applications thanks to EV Code Signing on SimplySign acquire an immediate reputation recognized by Microsoft. You can be sure that your software will not display the Microsoft SmartFilter message. Customers are given the opportunity to verify the creator of the software and receive a security guarantee of their code. The data signed with the certificate secure the creator's intellectual property. EV Code Signing Certificate on SimplySign protects many file formats, including with extension .exe, .docm, .xlsm, .pptm, .xpi, .jar, war, .ear, .dll, .ocx, .cab, .msi, .sys files, .cat, .msp, .xpi, ocx, ect. The EV Code Signing Certificate is supported by the following platforms: Microsoft Office, Microsoft Visual Basic, Firefox, iOS, Adobe, Java ect. class computers: PC and Mac OS X.
for an valid 3-year certificate: 36 months suport. WHAT DO YOU NEED TO USE SIMPLYSIGN? SimplySign is a mobile application thanks to which you will sign all the documents functioning in the electronic version. As part of this application, there is also an OTP code generator, which is needed to authenticate the user to the service of remote service signature (he can also install it on another mobile device). - Android - from v4.1 and above, - iOS - from v9.0 and above. SimplySign- download this application to your mobile device to use the OTP code generator, which identifies the user in the process of signing on a traditional computer: PC / Mac OS. As part of this application, there is also a module that allows you to sign documents on a mobile device. SimplySign Desktop - download this application so that you can use key services available on the market such as: Payer, eDeklaracjie, ePUE, etc. The SimplySign Desktop application emulates the connection of a physical cryptographic card and card reader to your computer. Thanks to this solution you will be able to use SimplySign in applications requiring a physical card. As part of this application, there is also a proCertum SmartSign module that allows you to sign documents on a traditional computer: PC / Mac OS. Processor: Pentium 1 GHz (or compatible). RAM memory: min. 4 GB. A minimum of 200 MB of free disk space before installing the application. The customer has the right to 30 days of testing the Code Signing certificate on SimplySign. If the product is less than expected, the customer has the right to exchange the product for another one or make a refund. To make a return, please contact the Asseco Data Systems SA Complaint Team at the following e-mail address: reklamacje@certum.pl. Detailed information about the complaint process can be found at: https://en.sklep.certum.pl/terms-and-conditions.